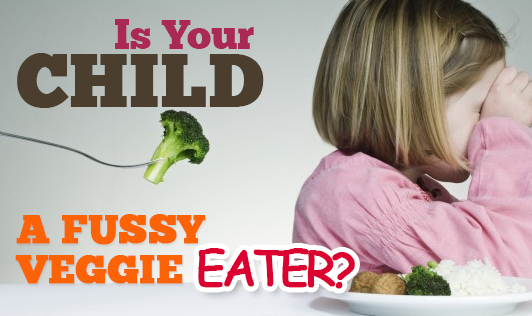 Is your child a fussy veggie eater? Carrot sticks are not your child's favorite snack? Don't worry here a few tips on how you can make your child eat the veggies! • Add finely chopped mushrooms, grated carrots, sliced onions to their pasta & noodles. • Add chopped onions & tomatoes to the omelet mixture or scrambled egg. • Grate some carrots to your idli or dosa batter. • Boil the spinach (palak), puree it and knead the dough with the puree to make green chapati. You can try the same with carrot to make orange chapati. • You could also try tricolor puri/chapati with carrot dough for orange, regular dough mixed with equal quantities of maida (refined flour) for white & palak dough for green. • Make a soup with mix vegetables, baby corn and green peas. You could cook & puree the veggies also. • Make a delicious dip from, low-fat yogurt, pudina (mint) paste, & few chopped coriander leaves and serve it with crispy baked potatoes and crunchy carrot sticks. • Stuff your bhindi with a mixture of spices, roasted onion paste (to make it dry), lime juice & salt with a base of besan (channa flour) to make it ‘chat-pata'. • Make stuffed baked potatoes with sweet corn, spring onions & red & yellow capsicum. • Make a vegetable cutlet with beetroot, potato, carrots & onions. Add some soya flakes to this to make it chunky. Make different shapes of the cutlet & roll them over bread crumbs before frying to make it crisp & nice. • Make a mixed vegetable filling and stuff the chapati/roti with this. • You could also make chapati & roll vegetable mixture in it with some grated cheese and serve with the curd dip. • For a healthy after-school snack, top a slice of whole-grain bread with sliced tomato, sliced mushrooms and sliced baby corn, sprinkle with a little grated cheese and microwave till the cheese melts. • Slice cauliflower, ladies finger, potato, capsicum, raw banana into thin long slices, add salt & leave it aside for a while. Then roll them over a mixture of rava (sooji), rice flour & red chilly powder and shallow fry to get crispy vegetables.